VietNamNet Bridge – The Vietnam Football Federation (VFF) Executive Board Meeting held this morning, December 13, approved the plan for the V-League and the First Division Tournament 2013. V-League 2013 will have 12 teams, instead of 14. In addition to the VFF’s members, the meeting had the presence of top officials of the Vietnam Professional Football JSC (VPF), including Chairman Vo Quoc Thang, General Director Pham Ngoc Vien, V-League Chief Organizer Tran Duy Ly and First Division Tournament Chief Organizer Nguyen Huu Bang. 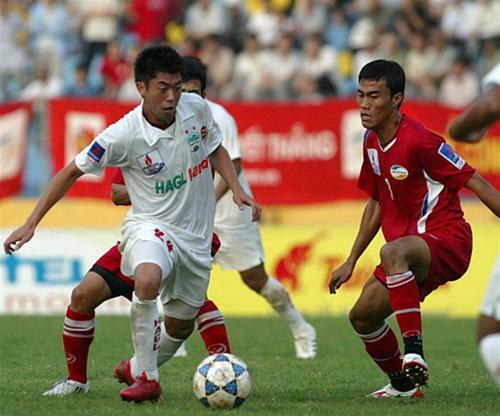 The most important decision made at the conference is that the Dong Nai FC, which ranked third at the First Division Tournament 2012, will be up-rated to play in the V-League 2013. The petition of the Hanoi T&T Young Team to play at the First Division Tournament 2013, though this team won a card to the V-League 2013, was also approved. The V-League 2013, therefore, will consist of 12 teams while the First Division Tournament will have 8 teams. However, these are temporary numbers in the time of crisis. The congress agreed that V-League 2014 will have 14 teams and the First Division Tournament 2014 will have 10 teams. To reach the numbers, in the 2013 season, one team of the V-League will fall to the First Division Tournament while three teams of the First Division Tournament will be up-rated to the V-League and one team will fall. The First Division Tournament 2013 will have a record low number of teams – 8. They will compete in a round robin, with 56 games and 14 rounds. Earlier, the VPF proposed to add the U22 national team to the V-League 2013 and no team will down-rate. Another important decision adopted as the meeting is the approval of the transfer of Khanh Hoa FC to Hai Phong. The team will be renamed into Hai Phong VICEM Cement.